How many ebooks does your marketing team have in its content arsenal? 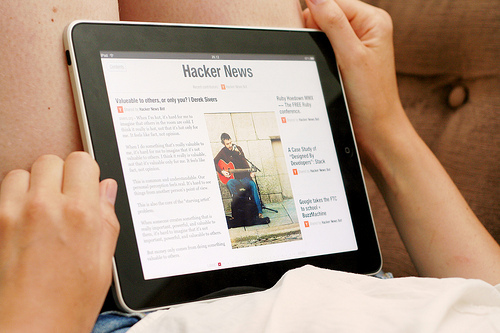 With the rise of tablet and e-reader popularity, ebooks are only growing in popularity. According to a newly released report by Pew Internet , in mid-December 2011, 17% of American adults had reported they read an ebook in the previous year; by February, 2012, the share increased to 21%. 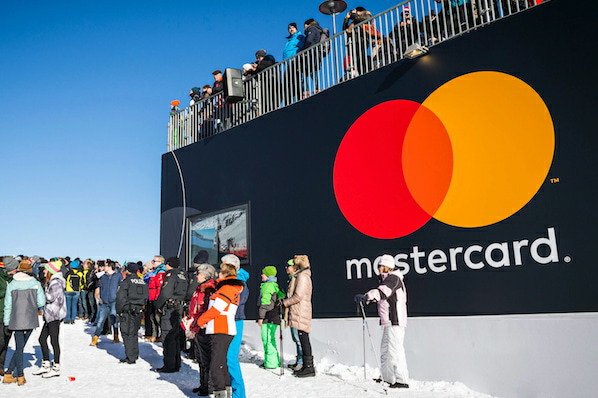 While we've always considered ebooks to be one of the best lead-gen content assets at a marketer's disposal, the fact that on-the-go content is only carving out more of a place in today's increasingly mobile world makes them an even smarter choice as a marketing offer . As a piece of long-form content, a lot of work must go into the creation of a well-crafted ebook . So today, let's focus on design. How do you design an ebook that is reader-friendly, engaging, and at the same time supports your marketing goals? Let's discuss the 11 essential elements that make up an effective marketing ebook design. If you take a look at the ebooks HubSpot has launched in the past 6 months, for example, you'll notice that they all have very consistent branding and design elements throughout. When you sit down with your marketing team and designer to decide on your brand style guide, establish rules for such design elements as fonts/sizes, color schemes, charts/graphs, borders for screenshots and images, headers, etc. 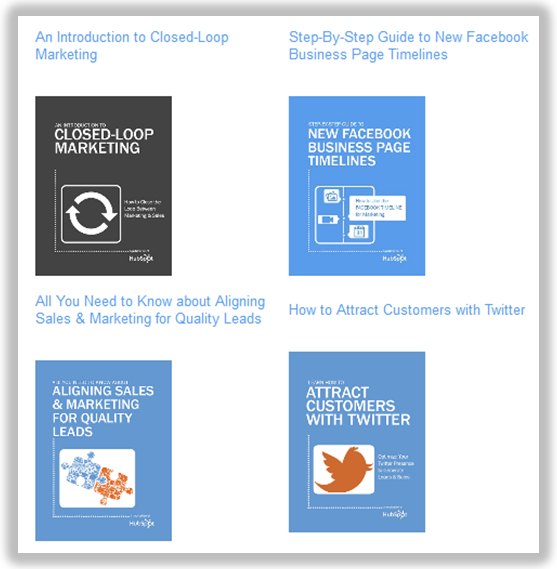 Creating easy-to-follow guides and templates for your various marketing assets like ebooks, presentations, etc. will make it easy for you and your team to implement a consistent branding style throughout your marketing collateral. HubSpot, for example, has an ebook template created in InDesign to ensure our ebooks have a consistent look no matter who created them. Now let's dive into the 11 essential design elements you should consider in your next ebook design. 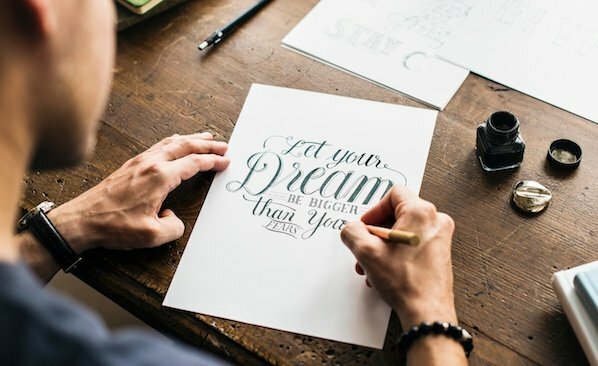 Okay, so your title choice may not exactly be a design element, but choosing a title for any piece of content is definitely an art , and it shouldn't be overlooked. The title is often the first thing someone judges before deciding whether to click on or read your ebook, especially when the content gets shared in social media. Choose a title that is both interesting and descriptive -- that is, it should be indicative of what the reader will learn from reading the ebook. Unlike blog posts, ebooks are high-commitment pieces of content because of their length, so you need to make sure you're demonstrating the value up front in a compelling way. 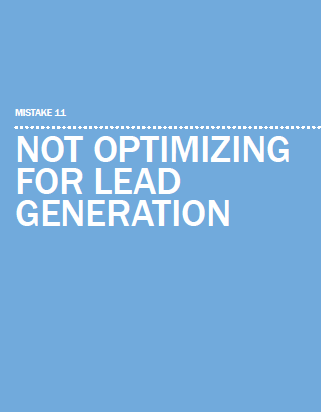 For instance, one HubSpot ebook is titled 15 Business Blogging Mistakes & Easy Fixes with the subtitle, "How to Fix the Most Common Blogging Bloopers." The main title is both descriptive and demonstrates value in itself, but the subtitle also makes it sound like an even more interesting read. So if we know that people will most definitely be judging your ebooks by their cover, you'll want to make sure you create ones that are both visually appealing and coincide with your brand style guide. Consider how the visual revolution is playing out with sites like Pinterest cropping up and other social networks like Facebook and Google+ putting more of an emphasis on visual content , and the importance of enticing covers becomes even more evident. Make the title easy to read, include branding elements you decided on in your brand style guide, and feature an image. You'll notice that HubSpot's ebook covers , for example, follow the same layout and structure while each featuring a different relevant an interesting image. Depending on your business and industry, you likely have a different buyer personas , whether you segment your target audience by demographics, skill level, topic interest, or something else. So if part of your strategy is to create content that is personalized for or targeted to these different audience segments, one helpful way to organize and differentiate between your content assets is through a tagging system. Incorporate your schema in your ebook design so your readers know which particular ebooks will be of interest to them, and which ebooks won't. You can do this in a number of ways -- through iconography, color schemes, or tags. Another design element you might want to include in your ebooks is an author page, particularly if you have multiple members of your team creating ebooks. For example, if the author of the ebook is an expert on that topic, an author page that highlights the author's bio and relevancy to the topic is a great way to add credibility to the content. On your author page, include a brief bio of the author, a headshot, and if you choose to, a way for readers to get in touch with the author if they have questions, such as an email address, Twitter username, or phone number. As an added internal benefit, you might find that members of your team are more willing to spend time creating ebook content if they know their efforts will be recognized publicly through an author page. A staple for any book, both print or digital, be sure to include a table of contents in every ebook you publish. This not only gives readers a sense of how the ebook is organized, but it also makes it easy for them to reference individual chapters if they decide only certain ones are relevant to them or if they want to refer back to specific sections later. To make this even more user-friendly for your readers, some programs like InDesign make it possible for you to hyperlink chapters/sections, creating a sort of interactive table of contents and allowing readers to jump to a certain section of the ebook when they click on the corresponding link in the table of contents. Clearly distinguish one chapter to the next with chapter title pages. This gives readers a clear indication of their progress through the book and helps set the stage for the section they are about to read. It can also serve as a landing page for that interactive table of contents you may have set up in number 5. 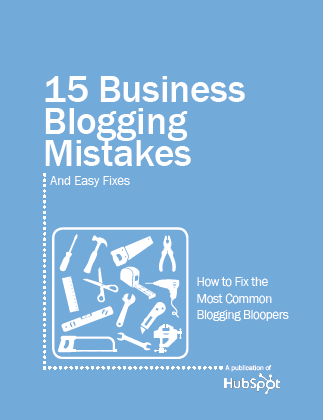 In our business blogging mistakes ebooks example, for instance, we organized the chapters by the 15 mistakes we highlight, and our chapter pages highlight which mistake the reader is going to learn about next. We've talked before about the importance of including social sharing buttons on your marketing content. Sure, the landing page behind which you gate your ebook is a great place for these buttons, but why not also stamp them onto the pages of your ebooks as well? It makes sense, right? A potential reader might not feel comfortable sharing your ebook before they've read it and know they like the content, but while they're reading it? That's a different story. Add these buttons to each page of your ebook -- either in the header or the footer -- so readers can easily share the book with their social networks no matter how far through it they've read. Just be sure you're sharing links to the ebook's landing page -- not thank-you page -- if it's gated content. 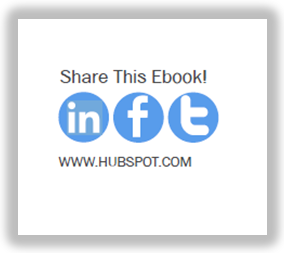 HubSpot's ebooks, for example, include social sharing buttons for LinkedIn, Facebook, and Twitter on each page. For help in creating these social media buttons for your ebooks, check out this handy guide . Break up your "big chunks of copy" and "large blocks of text" with visual elements to emphasize or explain certain points more visually. We're talking anything from headers, bolded text, and bullet points to screenshots, images, charts, and graphs. 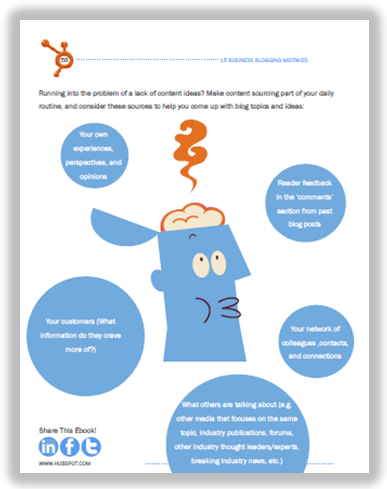 Furthermore, leverage content visualizations when appropriate to help you explain concepts that are difficult to explain through text and lend themselves to more visual explanations, as we did in this blog post , which is actually an ebook excerpt! 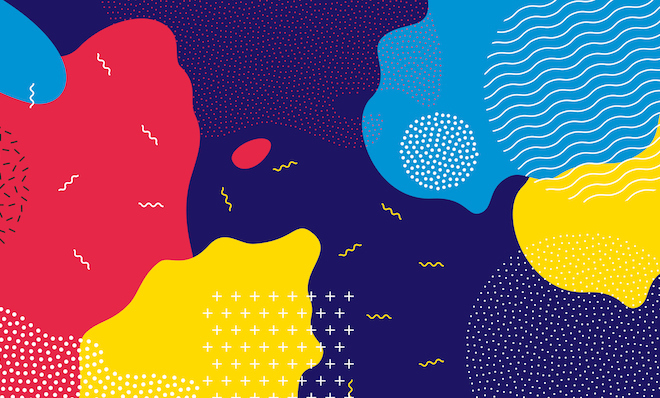 Just be sure to keep your visuals in line with your brand style guide, translating images, graphs, and charts to conform to your guidelines in terms of style and color scheme. While ebooks can be catered to achieve certain goals, the way most marketers use ebooks is to generate new leads at the top of the funnel. To achieve this goal, your ebook content should be majorly educational -- not product focused -- in nature. But does that mean you can't or shouldn't sneak in a few mentions of your product or service into them when appropriate? Absolutely not! In fact, when people are just starting to learn about your business in the awareness stage of the sales cycle, they probably know very little about the products and services you offer. Use educational ebooks as an opportunity to connect your thought leadership with product awareness. One way to do this in your ebook content is with subtle product mentions and call-outs when you mention a problem or need in your ebook that your products or services address. How much of these should you include? The key here is balance. Make sure the educational value of the ebook makes up for your product awareness plugs. 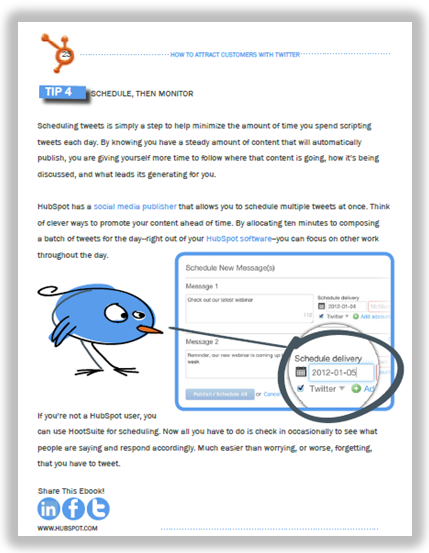 For example, in HubSpot's educational ebook How to Attract Customers With Twitter, we add to the section of the ebook that discusses scheduling tweets and monitoring responses by calling to attention to the social media publishing tool available in HubSpot's software, our paid offering. 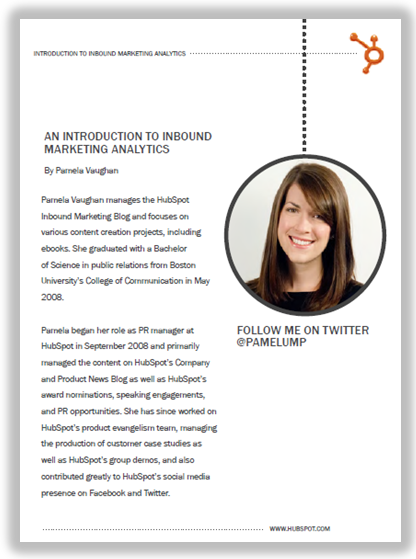 This lets readers with little or no knowledge of HubSpot's software connect HubSpot's thought leadership and expertise with its paid software. While your ebook is a digital publication, you'll likely be offering it as a downloadable file such as a PDF, and despite what you might think, many of the people who download will actually prefer to print it out and read it on paper rather than on a screen. For this reason, it's important to make sure your ebooks are printer-friendly. For example, avoid designs that leverage double-page, horizontal layouts that don't translate well to print. The best way to know if your design is printer-friendly? Print it yourself! Furthermore, you'll also want to make sure your ebook file is mobile-friendly. Does your ebook PDF view well on a smartphone and various e-readers/tablets? Test it out! If you're considering making your ebook available for sale through ebook marketplaces like the Kindle Store, things get a little bit more complicated . You'll need to conform to the specific ebook format of that particular store, and you'll likely need to make chan ges to the style, design, and file of your ebook. 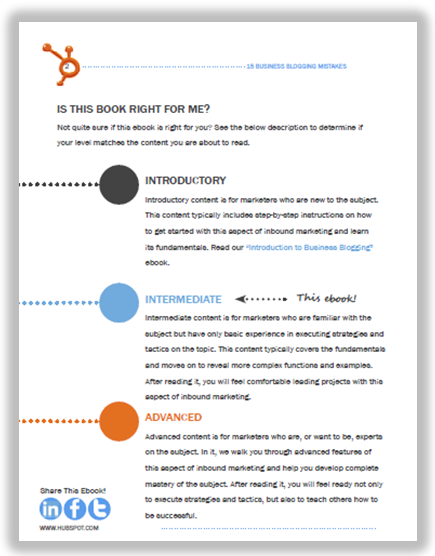 In general, you'll need to modify your ebook to embody a very simple design with few visuals and limited formatting. Publishing services like Lulu.com can make this process more easily manageable. 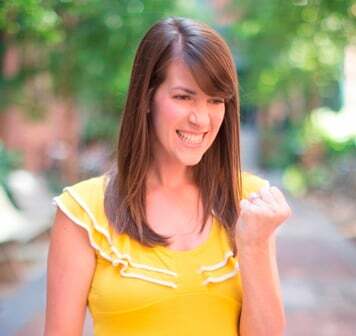 The last critical element that should be a part of your ebook design is -- you guessed it -- a final call-to-action! After a reader has completed the ebook, what action do you want them to take next? Tell them! Perhaps you'd like to encourage them to move from the awareness stage of the sales cycle onto the evaluation stage of the sales cycle. In this case, feature a call-to-action for a middle-of-the-funnel stage offer on the last page of your ebook, introducing it to the reader in a way that is relevant and logical. 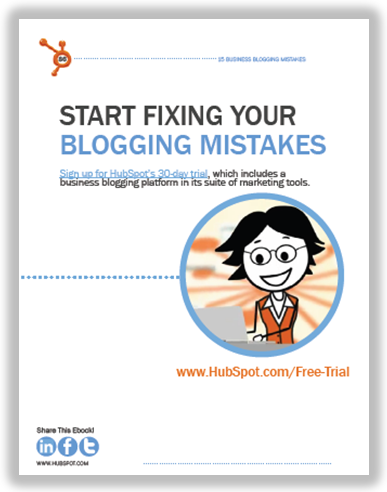 In our 15 Business Blogging Mistakes ebook , for instance, we encourage readers to start a free 30-day trial of HubSpot's software , relating it to the content of the ebook by emphasizing that readers will be able to try out HubSpot's business blogging tools to help them fix the blogging mistakes they learned they are guilty of making. Do your ebooks have a consistent design that reflects your business' branding? What other design elements would you add?